Compliance with requirements under the Data Protection Act requires a robust audit trail, and our off-site Shredding Services offers you a ‘Cradle to Grave’ solution which delivers 100% client satisfaction. Our security vetted Customer Service Operators collect all of your sensitive information, which is then securely transported to one of our nationwide serving, 12 Regional Depots. It is then shredded and processed within 24 hours of collection. We will supply you with a Certificate of Destruction detailing the collection and shredding details, if required. “Securely transported” means just that, with all our Collection Trucks and Regional Off-site Shredding Depots being fully alarmed and 24x7 CCTV surveillance installed at every depot for additional security. Utilising ‘Advanced Shredding Technology’, the shredders at the depot produce an output of 2 – 4 tonnes of waste per hour, whilst minimising dust and power consumption. Once your information has been shredded it is then baled and sent for recycling. This system of destruction means that we will deliver a pre-determined number of 120 litre capacity, lockable Security Containers FREE OF CHARGE to your premises. This will be dependent on your staffing levels and shredding requirements. The sacks inside the containers are subsequently filled with your sensitive information by your staff, and collected on a regular basis as above. As an example, the cost of this OFFSITE Security Shredding Service (including the loan of up to 3 Security Containers), is just £60.00 per visit. 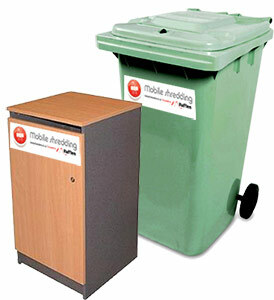 Additional containers can be delivered and shredded at an additional cost of just £9.95 per container/120 litre sack. Simply supply us your details for a no obligation quotation. Please note that RUFFLES can also advise on any type of Commercial and Industrial Shredding, Shredding for Private Individuals, Nationwide Shredding for all of your location, Office and IT Recycling. Simply call 0845 5555 007 for more information.